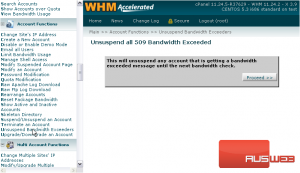 By default, an account will be suspended when it exceeds its monthly bandwidth limit. You can temporarily unsuspend such accounts using a tool in WHM. 1) It’s in the Account Functions category. 2) Choose Unsuspend Bandwidth Exceeders from the list. This will unsuspend any and all accounts that currently display a bandwidth exceeded message, but only temporarily, until the next bandwidth check. Bandwidth is typically checked daily. That’s it! Any accounts that were suspended because of excessive bandwidth usage should now be active. This is the end of the tutorial. 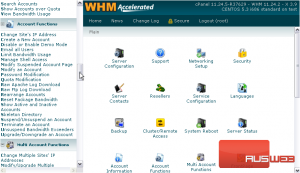 You now know how to unsuspend all accounts that have exceeded their monthly bandwidth limits in WHM.